Taylor Hidalgo fears what Subnautica‘s oceans hide. 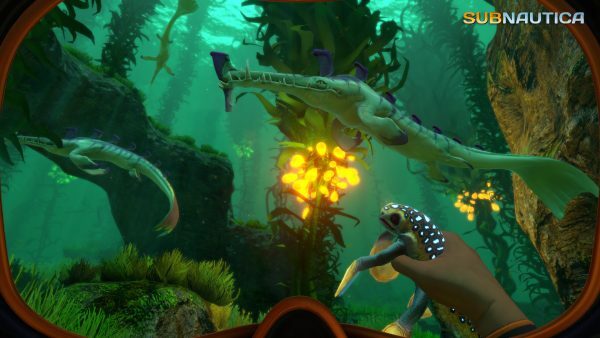 Subnautica isn’t a game about anything in particular. At least, not for me. It has crafting mechanics, certainly, and a narrative, but what really calls to me are its depths. The cool, crushing, oxygen-squeezing uncertainties of the unknown deeps and caverns call to me in a way that the story doesn’t. I’m honestly not sure I even want to be rescued. This world is beautiful—if strange—and I’m enjoying bumbling around in it. The ocean is teeming with life. It overflows with such an enormous amount of motion that it can become disorienting. Schools of fish flurry around at all times. Various herbivores and carnivores glide in the background, drawing motions in the periphery that rake at the attention span. Is it danger? Is it harmless? Is it sustenance? There’s a lot going on at every given point, and I struggle to take it all in. The ocean is beautiful in a way I rarely think about. Beneath the gentle chop of the waves is an entire world to which I have little access. Oxygen, a resource married inextricably with the act of living, is squeezed out faster as the light fades and the depths open. The deeper the waves, the darker the world becomes, until it seems like this world has shifted and now follows newer, more alien rules. Every new area I find to explore comes with new dangers to flee, new materials to inexplicably hoard, and new ideas to experiment with. I’m not trying to do anything in particular, at least not most of the time. I’m largely just trying to see what happens when I do things. It’s a toddler approach to the scientific method, but one that feels enjoyable to experiment with. As the ocean floor sinks to new depths, I find myself clinging more closely to my handheld vehicle, to my light, to keeping things that unnerve me in the center of my focus. The water has grown dark, and the things in it are more dangerous than the lighter waves and gentle flurries of motion in the shallows. Growing from the walls are things I should collect: gemstones, crafting materials, food items, and the outcroppings that conceal things of use for me. There’s a give-and-take to the experience. Scouring the walls is how such useful materials are found, but the dangers rarely come from the walls. They lurk the open ocean, swimming behind the backs of divers who are paying attention to the outcropping that house all of the material. Danger behind, earnings in the front. Alternatively, one can keep an eye on the dangers but could easily miss the materials worth swimming in the deeps to find. I wonder if this is how the sailors felt when sirens would sing to them, knowing very well the sinister provenance behind the sonorous call. The feeling of satisfaction in making a successful excursion into the murky, dark unknowns is difficult to put vocabulary to, to put a finger on precisely. Perhaps it’s like successfully assembling Ikea furniture or finally putting together an old, challenging Lego kit. The fact that, with minimal instruction, all the elements have come together and fit. The dark waters and copious dangers sit at the edge of nervousness, working against the desire to keep exploring, keep diving, keep dwelling in the danger. I don’t know what all these materials I keep finding will ultimately be useful for. I’ve made a base for myself full of things that will help me survive, but not really anything that will help me do much more than linger. I am skittish every time I push into the unknown, fearful of losing progress I’ve already made. Having my vehicles destroyed by something aggressive in the depths, or an item I need being ripped from my hands in death. I am afraid of everything in the deep, but I keep wanting to go there. I think what ultimately fuels my desire to go deeper, to see more—to grab and craft and explore and fear and flee—is in knowing that there is more below. Just push a little bit further, and there will be a new set of lifeforms thrashing through the deep blues and purples of this hostile, incomprehensibly alien world. Just beyond that, perhaps, a new material will reveal new crafting materials or new blueprints. There are new things in the depths that I find myself wanting to know about. Not chart, perhaps, but to become familiar with. To make the scary unknowns deep in the waters become knowns. At least, known enough to be managed. Creatures with unknown capacity to do damage are terrifying, but known capacities can be planned for. I know what’s coming, so naturally they’re less haunting. I want to be able to exist in this world without fear of what I may find around the next corner. In the true dark of the ocean, I begin to see things that haunt my nightmares. Things that can outpace all of my vehicles, swallow me in a single fleeting moment of aggression, and could destroy everything I worked to create. I avoid these. I don’t want to pick fights with them. I just run. I’m enjoying the feeling I get while steadily climbing my way to new materials, new experiences, and new depths to explore. 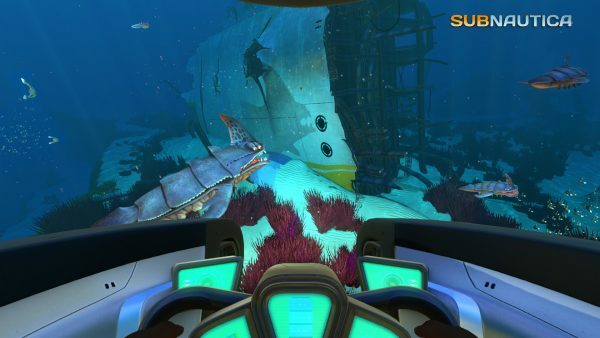 However, I struggle to personally justify Subnautica as an experience. No matter how successful I am through the course of the game, I never shed that feeling of anxiety, the sense that anything and everything can and will kill me if I slip up. That feeling is awful, and it should make me hate it, but just above it is something else. Something a little bit beyond my reach, something that makes me want to push in a little more, even though the danger clings to my anxiety. Something that makes me want to master my fear a little bit, so I can go further. Something even beyond that feeling of putting an excellent dive together, beyond that sense of triumph over the challenges the deeps hold. Something else. I don’t know what it is. I don’t know what I’m doing, but I sink deeper into the ocean. Who knows what awaits me?